Not only is the number(s) inside a designer bag one small part of proper authentication, it also oftentimes reveals the time of manufacture or the season of the bag. 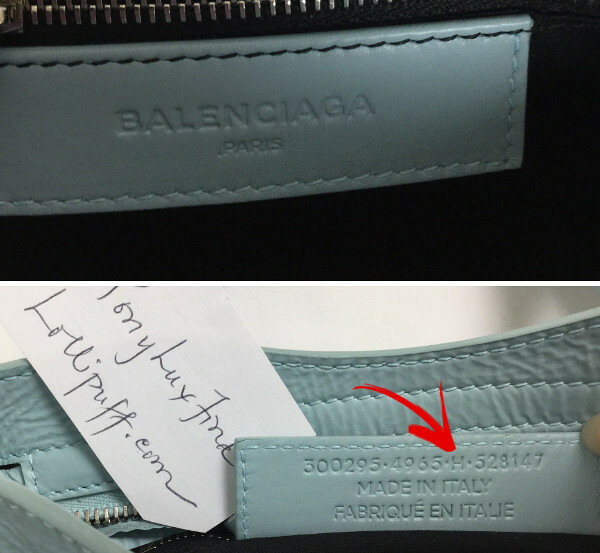 Here's a guide to tell how old a Balenciaga handbag is just by looking at the tag. Oftentimes, there is a letter on the stamping of a Balenciaga bag that will date the season and year of the handbag. On metal tags (Balenciaga tags that have a metal plate), the letter following the first sequence of numbers will reveal the season and year of the bag. For Balenciaga bags with metal plates that are older than Fall / Winter 2003, this letter will be missing. In the example above, this would be the letter L. Using the lookup below, we see that this bag is from Spring Summer 2012. On leather tags (Balenciaga tags without a metal plate), some bags will not have this letter no matter what year or season they belong to, making it more difficult to date the bag. However, if the leather tag has this letter that allows dating, it will be located somewhere on the backside of the tag. In the example of the leather tag above, this would be the letter H. Using the reference list below, H corresponds to a Spring Summer 2014 bag. This bag has the letter B which means it is a 2004 Fall / Winter season bag. The letter H on this bag tells us that this bag is from Spring Summer 2014. As stated previously, dating a bag is only one very small part of authentication. This last picture reflects a very common fake tag. Notice how it also has a date letter. To shop worry-free, check out Lollipuff's pre-authenticated Balenciaga bags. Great prices and no replicas ever! 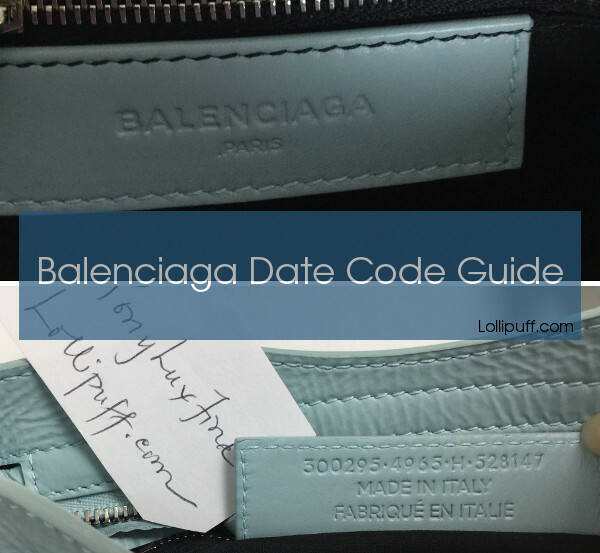 We hope that this blog post helps you in dating your own Balenciaga bags. For similar articles, check out how to date Louis Vuitton bags and how to date Chanel bags.